Paris: There was a stark difference in the Indian presence at Eurosatory, the just-concluded biennial defence show here. While the previous edition, held in June 2016, had seen some of the heavyweights of Indian DPSUs, including the Garden Reach Shipyard and the Ordnance Factories Board, as well as the Defence Research and Development Organisation (DRDO), the turnout of Indian companies at this years edition could hardly have been more different. Leading the Indian presence was the Brahmos Aerospace Indo-Russian joint venture that can easily be termed the most successful example of an Indian firm developing an entire range of new products that not only meet the requirements of the Indian defence forces, but also elicit regular enquiries from numerous potential buyers around the world. Colonel J.P. Uniyal, Director of Business Development and Product Support, at Brahmos said that even though Brahmos had skipped the last edition of Eurosatory, the participation this year has been very successful and highly satisfactory. 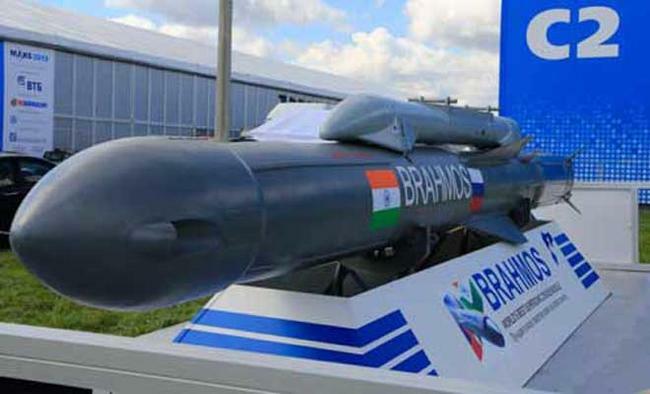 "We have had numerous meetings with potential buyers who are very interested in our products and especially the recent innovation of the variants that can be launched from an aircraft, as we have proven by testing Brahmos on the Sukhois used by the Indian Air Force," Uniyal told Media India Group. According to Uniyal the principal enquiries came from countries like South Korea and Brazil. "With some of these countries, we have been having discussions for a while. But it was important to be here and meet with them again as in the weapons' business, like any other business, you need to be seen at key global platforms such as Eurosatory to stay on the top of the mind of your customers. If you are absent frequently, then they tend to find other suppliers," he said. Brahmos had also perhaps the most appealing display at the event, amongst the Indian participants. MKU, a Kanpur-based defence manufacturer, too had an active presence at the event, with the company displaying several of its products to attract buyers at the event, a strategy that perhaps proved to be highly successful, if the beeline of visitors to MKU stall was any indication. One highlights of the Indian presence at the Eurosatory was the participation of a number of Small & Medium Enterprises in the domain of defence, ranging from protective gear and clothing to speciality steels and manufacturers of ancillaries for larger defence material like tanks, trucks and guns.Sweta Chaudhry Singh, Director of Frontier Protectivewear, a manufacturer of protective clothing based in Kolkata, said the participation in Eurosatory was good for her firm. "Basically, it was a good show for us. We had come to develop our market in Europe further as we already have some customers in Germany. We were also looking for new partners and on both the parameters, the show proved to be successful," she said.Though there were only a handful of Indian firms that had their own stall like Frontier Protectivewear at the event, a number of SMEs had also come as part of delegations led by chambers of commerce such as FICCI and ICC, Kolkata. "These firms were looking for collaboration in terms of boosting their design capabilities as well as to identify those French and global partners who could be interested in transfer of know-how to Indian companies," said Sourav Raichudhuri of the Paris Chamber of Commerce (CCIP), which had organised B2B meetings for the Indian delegation. The Indian companies were also scouting for clients who needed their prowess in software development. Drones and composite materials were high on the wishlist of the Indian firms.